The Trikke snow carving vehicle is an innovative three ski vehicle that takes the best of popular snow vehicles of today and combines them into a completely new machine in form, function, and riding experience. 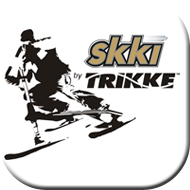 The SKKI is the innovative and successful winter sports version. The patented design and high quality engineering makes it possible for a rider to propel the Trikke carving vehicle forward without pushing ... just rock and roll! Often mistaken as a scooter when seen for the first time, the Trikke carving vehicle immediately sets itself apart when a rider hops on and takes the first few turns. People often ask "What makes it move?" Trikke carving vehicle's movement has the rhythm of in-line skating, surfing, snowboarding, or skiing on pavement because the entire vehicle leans in unison due to its finely coordinated (and patented) cambering mechanism. Rhythmic weight transfer from one leg to another is the key to propelling the Trikke carving vehicle forward. It's fun to ride and it feels great!